For those of you that don’t know, my husband is Turkish. We eat a lot of Turkish inspired meals at our house. Falafel is just one of those. So I made a baked falafel burger. Since traditional falafels are fried, I wanted to make them healthier by doing a baked falafel burger. These baked falafel burgers came out great! 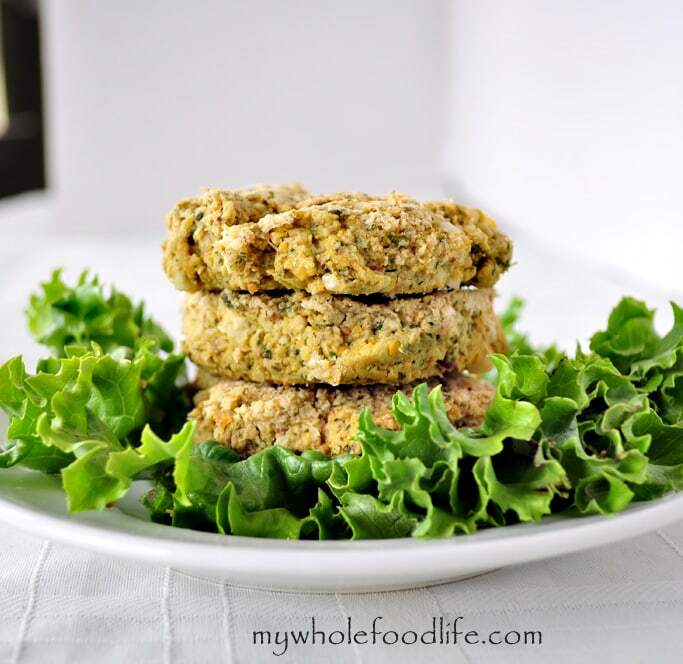 I am a lover of all veggie burgers and this is just another great recipe. You can eat this on a burger bun, but I prefer to eat them as is or with a little veganaise. They would be great on top of a salad as well. If you like falfel, you will love this healthier version! Preheat oven to 350. In a food processor , combine the chickpeas, onions, garlic, lemon juice, cumin and salt. Pulse a few time to break everything up. Then add the spinach and parsley and pulse a few more times. Lastly add the egg, almonds and flour and pulse only until everything is well combined. Form mixture into patties and place on a lined or greased baking sheet . Bake for about 15-20 minutes. Flip the patties and bake for another 10 minutes or so. Just one question----Is the spinach raw or cooked and if cooked leaf or chopped????? It's raw. I just threw it in the food processor whole. I used baby spinach. Can these be frozen before baking? Do you know how long they would keep? Thanks for all the great recipes! I just found out my newborn has issues with dairy and in order to keep nursing her, I need to be dairy free. Your website has helped immensely with my new diet change! I'm glad I could help! My kids both had issues with dairy. I think these could be frozen. My batch lasted about a week in the fridge. I would like to make them nut free. Do I need to replace the almonds with something else or can I just leave them out? thanks. I just put them in there for crunch. Sunflower seeds would be a great nut free option. Just got my first countertop grill and I think these might do well in it. Your thoughts? I'm not sure they will work on a grill. They may be a bit too delicate. Delicious! I never knew your husband is exotic. :) Melissa, are you on Instagram? Thanks Olena! Not yet, but it's on my to do list. Made these today and they are AWESOME! I forgot the salt, and it definitely needs some. I made them into "pucks" so that I can put them into pita bread - got 15 total from this recipe. YUMMY!!! and easy to make! Awesome! I'm so glad you enjoyed the recipe! Made these tonight. Never had a falafel before. They were awesome. I sauteed the onions and garlic first. Mashed the garbanzo beans with a masher for texture. Substituted the flour with ground flax seed. Served on a tortilla with tzatziki. A friend of mine recommended your site to me and I have to say I'm learning so much and loving it! I am new to being vegan and had a question on how to do the egg replacement with flax? Glad you are enjoying the blog! Yes I flax egg is super easy. To make one "egg" take 1 tablespoon flax meal + 3 tablespoons warm water. Whisk together and throw in the fridge for 1 minute. It will become gummy like an egg. Works great in every recipe I have tried. Sorry it came out runny. :( Try adding some flour. This recipe had great flavor! However, my mixture also came out very runny. I had to add 1/2 c flour, and it was still soupy. I figured I'd just ladle it onto the baking sheet, and they did bake up alright in the end. Do you think using canned chick peas made a difference? Again, great flavor and I will try them again! Glad you liked the flavor! Sorry they were runny. :( Not sure if the canned chickpeas made a difference. Did you drain them before using? Hi there- could I use frozen spinach that's thawed or does it need to be fresh? I made these for the 1st time yesterday, they came out great! I just added a 1/4 cup cilantro in the mix to add some oriental flavour to it. We ate them with a homemade tahini/yogurt dip and a salad. Thanks for this hearty, healthy, easy recipe!